NASA ANNOUNCES NEW EXOPLANET DISCOVERIES | Alyss Edusolutions Pvt. Ltd. The US National Aeronautics and Space Administration held a press conference today announcing newly discovered Earth-sized planets orbiting a single star in the Trappist-1 system. Three of the seven Earth-sized planets are found within the star’s habitable zone, meaning liquid water, and even more amazingly, life, could exist on the planets’ surfaces. We won’t be taking any trips there anytime soon, unfortunately. While the star system is located nearby in a cosmological sense, it’s still around 40 light years away. 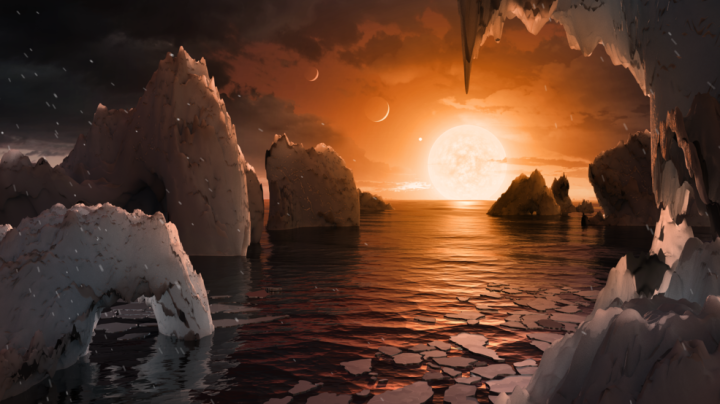 Artist’s rendering of Trappist-1f, an Earth-sized planet that could support life. That means even at the speed of light, the trip takes 40 Earth years.